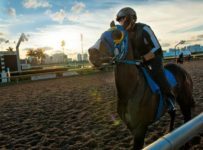 Gulfstream Park hosts 9 horse races Friday, with a first post of 2:00 PM, and a last post of 6:02 PM. That’s about an average card for a summer weekday. The 10 races produced little fan fare, except Gran Saman’s 18:1 win in the third race. 54 starters ran and 6 of 6 on the Rainbow 6 yielded a payout of $1,132 to 37 winners. Friday’s card schedules 9 races, and 90 starters. There are five turf races (1,3,5,7,9). The Rainbow 6 commences with race 4 at 3:30 PM ET with a two-year-old maiden claimer. 63 starters are scheduled in the Rainbow sequence, races 4-9. We look for some increased pools, given the mandatory payouts announced for Sunday’s card for the Late Pick-5, Super Hi-5, and Rainbow 6. Friday’s carryover will be $93,857. The Super Hi 5 will no doubt be run in race 1 Friday, with 10 starters scheduled. That carryover is $1,919.